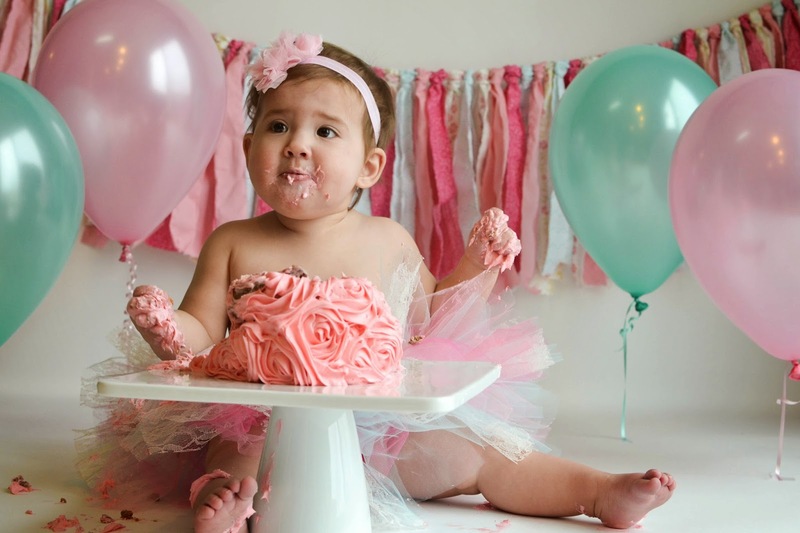 Grace will be turning one in a couple of months, and I have really been wanting to do a cake smash with her. Today, that is exactly what we did. 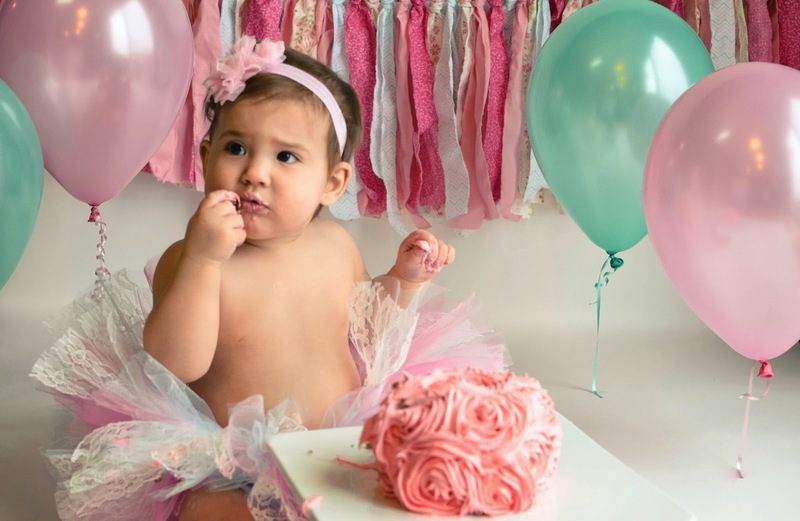 What is a cake smash? 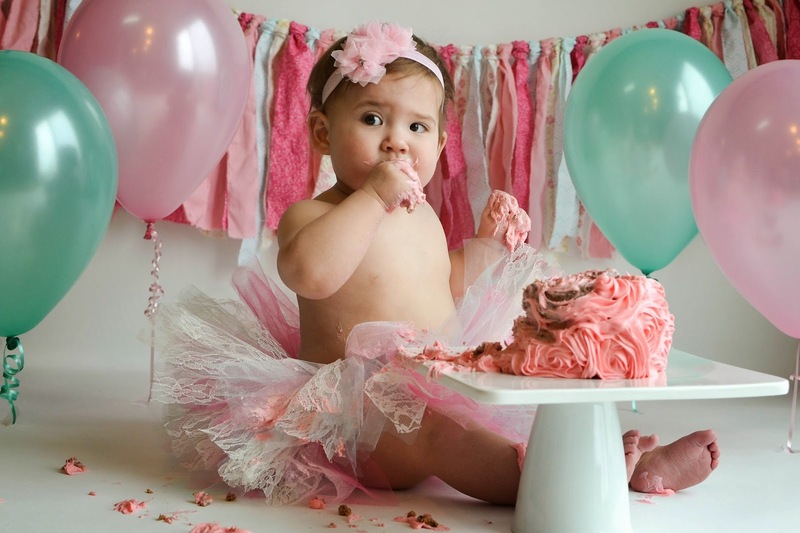 A cake smash is a fun way to mark a baby's first baby by giving them their own little cake to eat and destroy until their little heart is content. They get their first bite of cake and you get fun photos to mark the occasion. 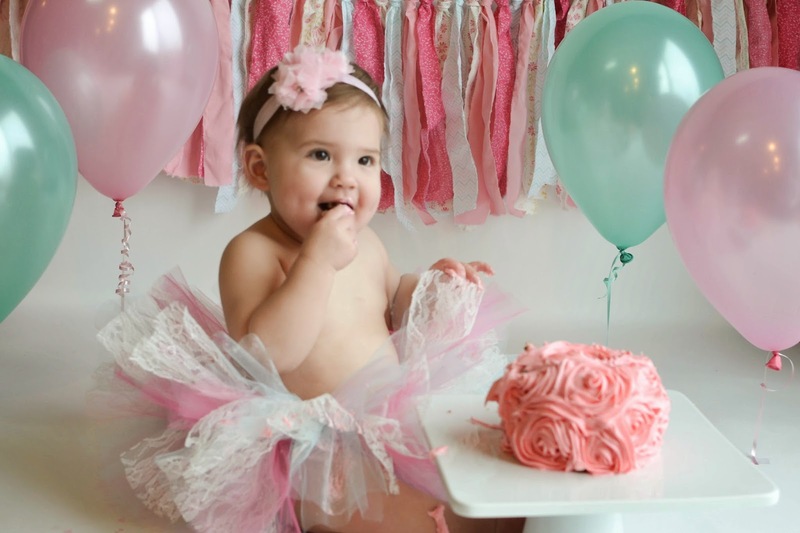 I wanted to get it done now, so I could focus on enjoying Grace's birthday instead of worrying about pictures and the mess. 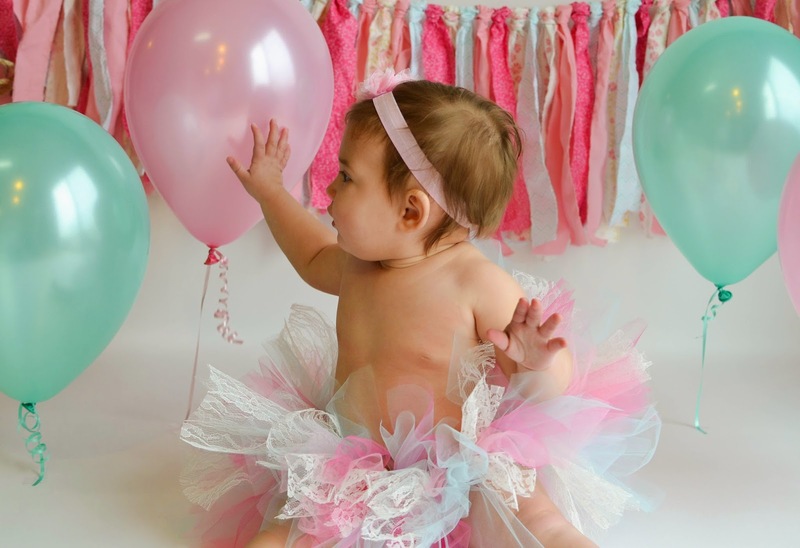 Plus I wanted the photo for her invitations. I am not a professional photographer by any means, and did not use any fancy equipment to capture these photos. 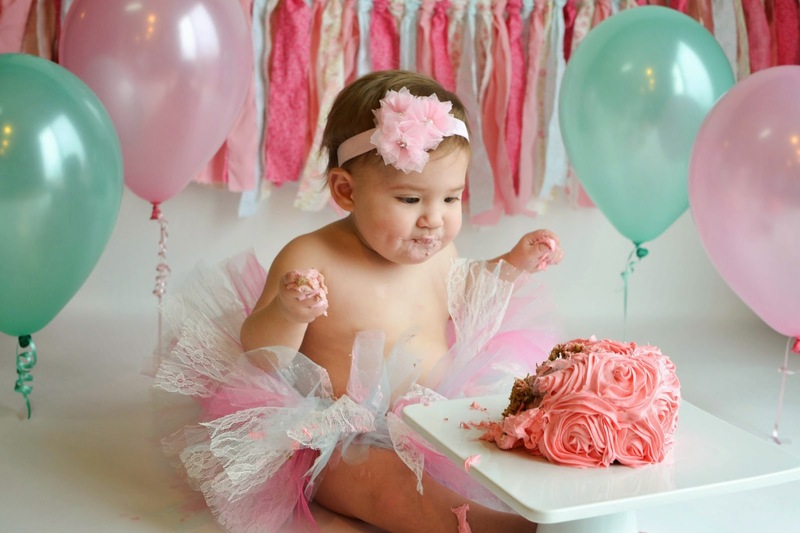 If you have a little time anyone can set up a cake smash. Sure the photos may not be professional quality, but your child may be more relaxed in a familiar environment. 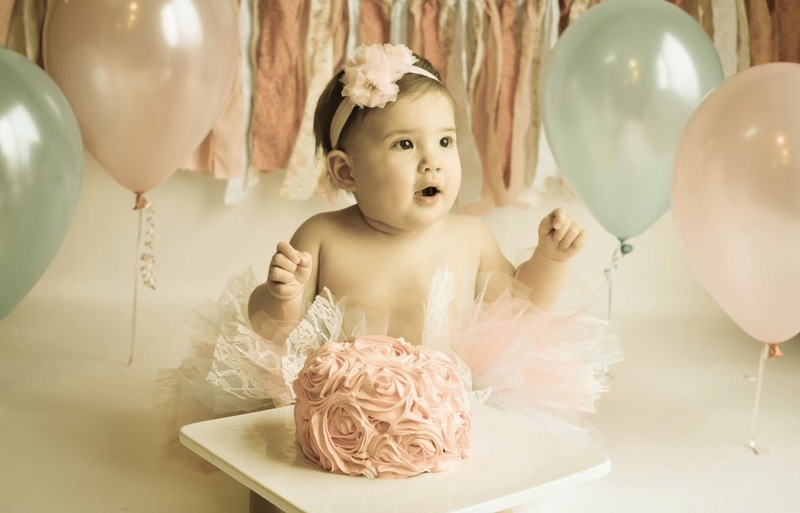 Background: Many professional photographers use seamless paper for cake smashes as it makes for easy clean-up and provides a clean colored background. This is what I used. For about $25 I got a roll that is 52 inches wide and almost 36 yards long. Tip: If you have a very mobile child you may want to invest in a wider roll, but the 52" width will probably still do the trick. The paper comes in a large variety of colors, so the possibilities are endless. 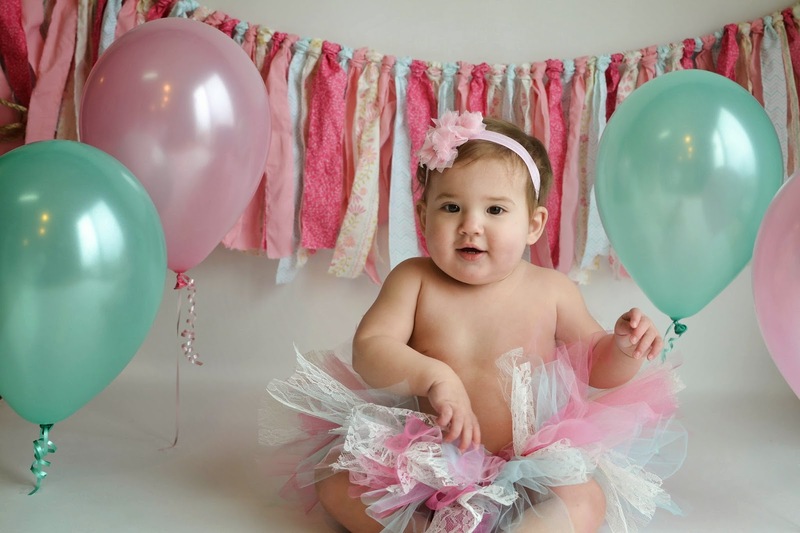 I went with seamless paper simply because it was the easiest way to create a nice backdrop and clean up was a breeze. If you don't want to invest in the seamless paper you can use any other fabric or paper you want. However, your photos may require more editing in photoshop due to wrinkles. Plexiglass sheet: I actually did not use this, but if you choose to go with fabric for your background it will come in handy. You can minimize a lot of the wrinkles in the fabric by placing a plexiglass sheet on the floor over the fabric before you begin shooting. The plexiglass also gives a fun reflection of those chubby little thighs. Backdrop Stand: I didn't use a backdrop stand either because I already had a wall right next to a big sliding glass door. I just taped the paper to the wall using painter's tape. However, not everyone is lucky enough to have a good natural light source next to a empty wall. If that is the case for you there are several inexpensive plans for PVC backdrop stands you can find on Pinterest. 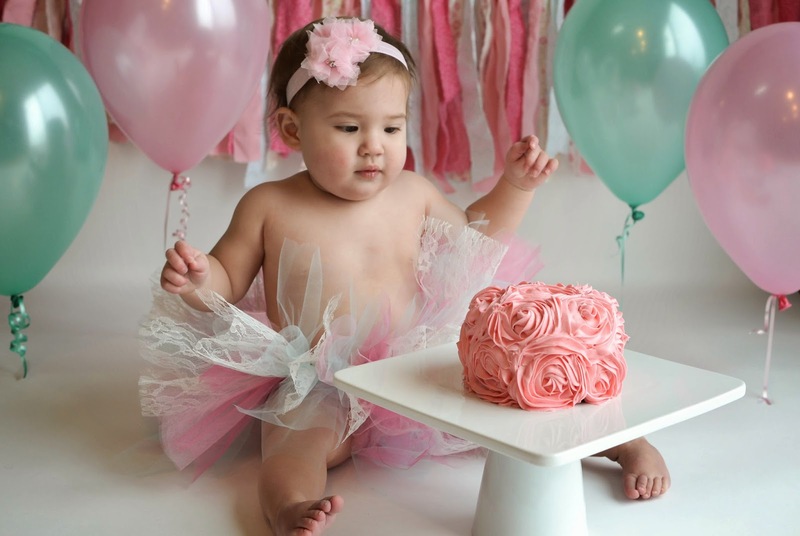 Decorations: Grace's theme for her first birthday is shabby chic, so I tried to incorporate that into the cake smash. I created a fabric garland from fabric scraps and twine to hang on the wall. I also picked up a few balloons at a party store and taped them to the floor. Regardless, the decorations are completely up to you. You can go as crazy as you want or omit them entirely. Camera: I used an entry level Nikon dSLR with a 35mm prime lens. I also shot in aperture priority mode because I did not trust myself to get shots in manual with a fast moving target. However, you can use any camera you own; no need for fancy equipment. Good Lighting: As I mentioned above I set up next to our large sliding glass door in the dining room. It worked great, but it would have been nice if it was a little sunnier outside. 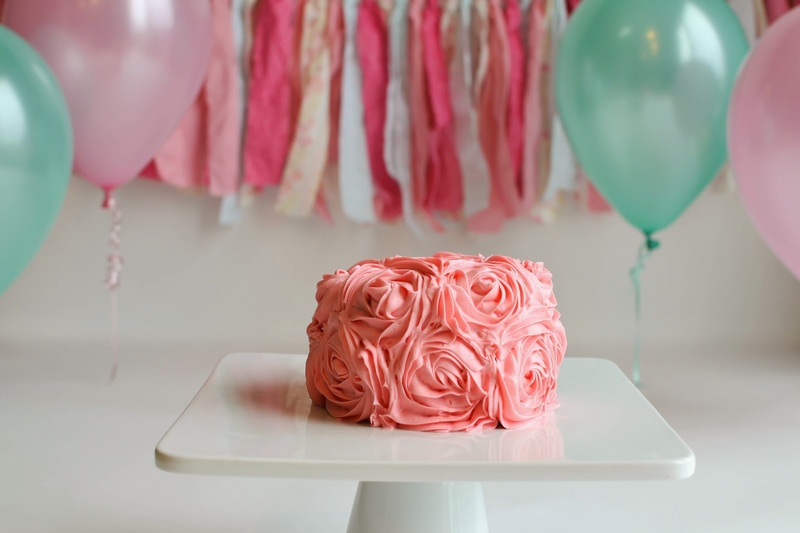 Cake: A standard white bakery cake at room temp photographs best. However, since I am one of those crazy moms that thinks sugar is evil I really didn't want a standard cake. I made a 'healthy' sugar-free carrot cake sweetened with ripe bananas and dates topped with a cream cheese and butter frosting dyed with fresh strawberries. You can find the recipe here. Since this cake was a little denser than a standard cake it did not crumble as nice. 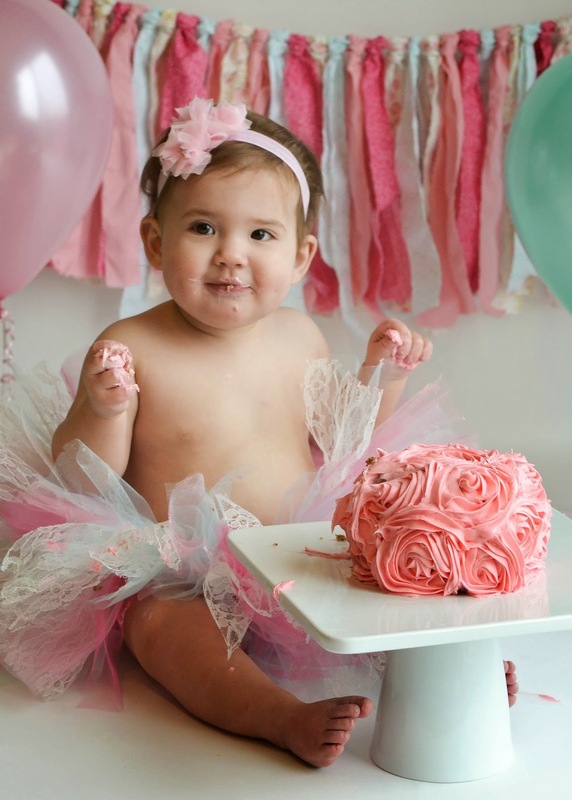 However, it was a small price to pay to avoid the sugar, especially since Grace ate A LOT of cake. 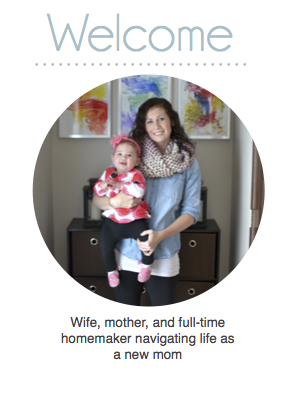 Help: You are going to need someone to wrangle the little one while you are busy shooting. 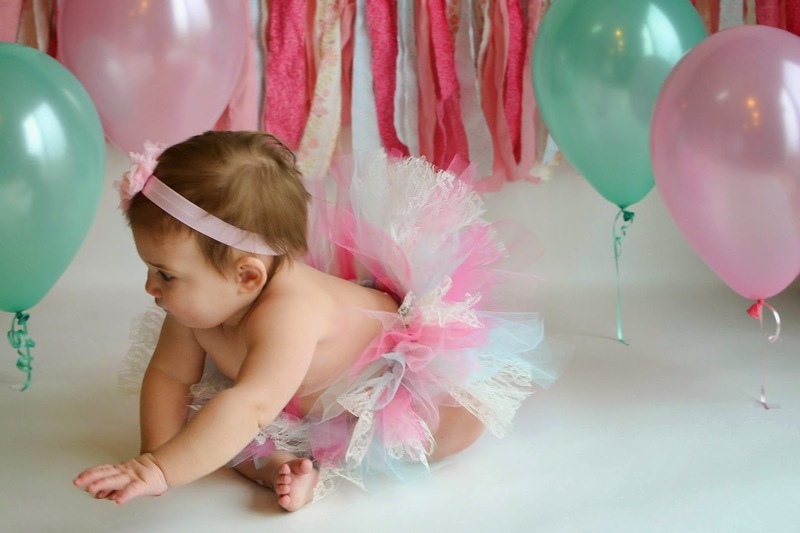 Grace kept trying to crawl away and was very hesitant at first. 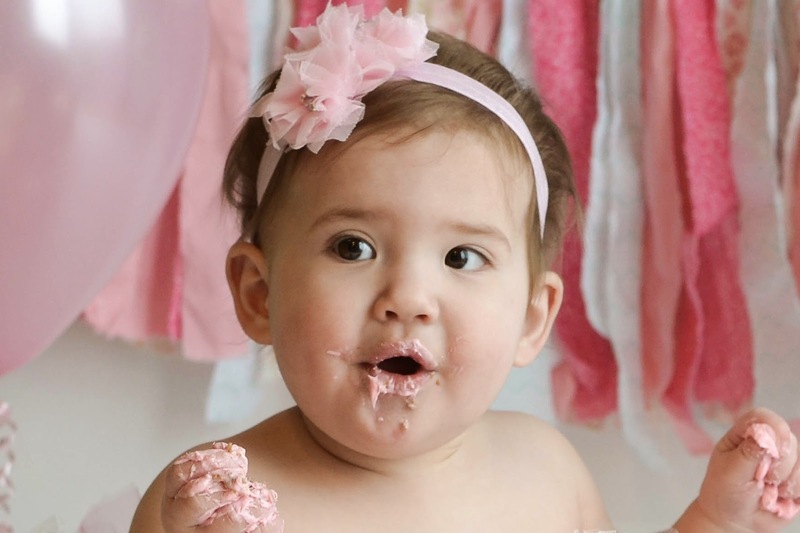 I am so glad Anthony was there to help keep her near the cake, and to help with her first taste. 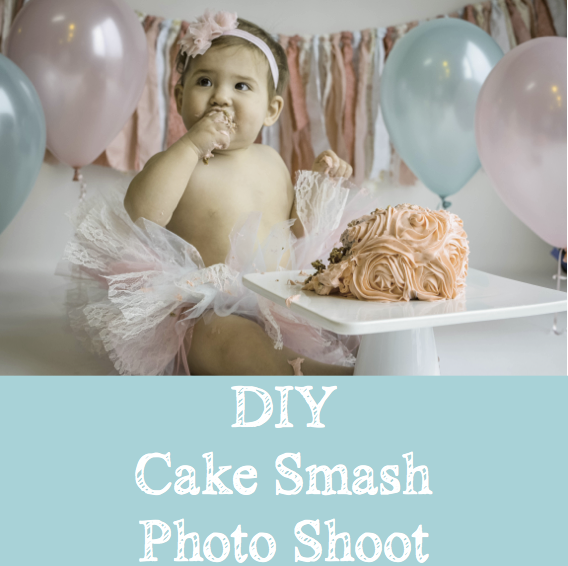 Here is a step by step look at how our cake smash went. I taped the paper to the wall with blue painters tape. 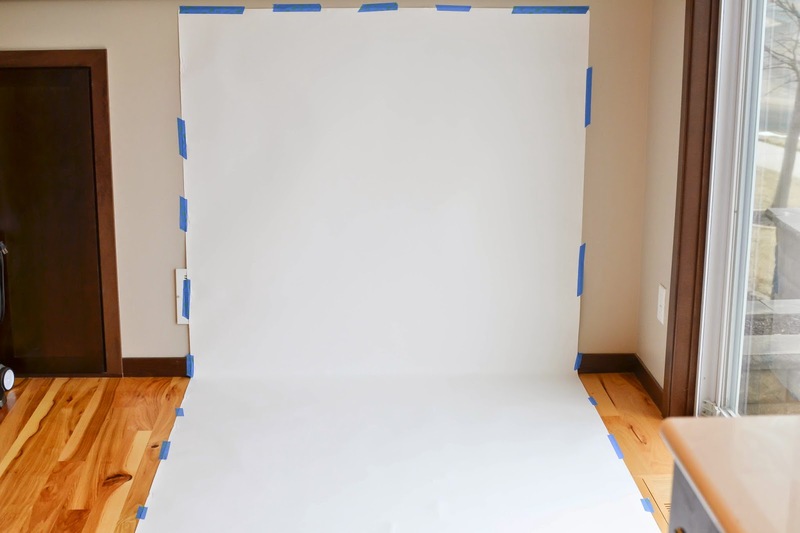 Make sure to leave enough paper on the floor to create depth in your photos. Now it was time to decorate. 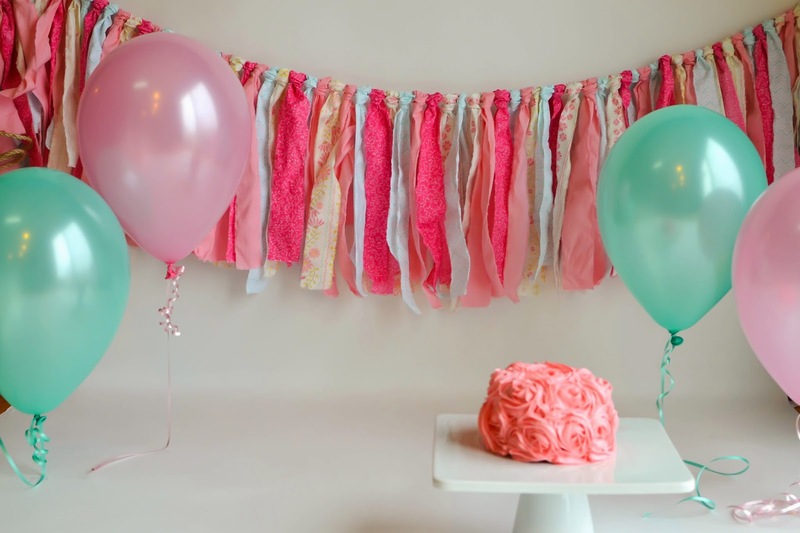 I added a fabric banner to the wall and taped 4 balloons to the floor. Make sure not to put your decorations too high or they will be out of the frame. 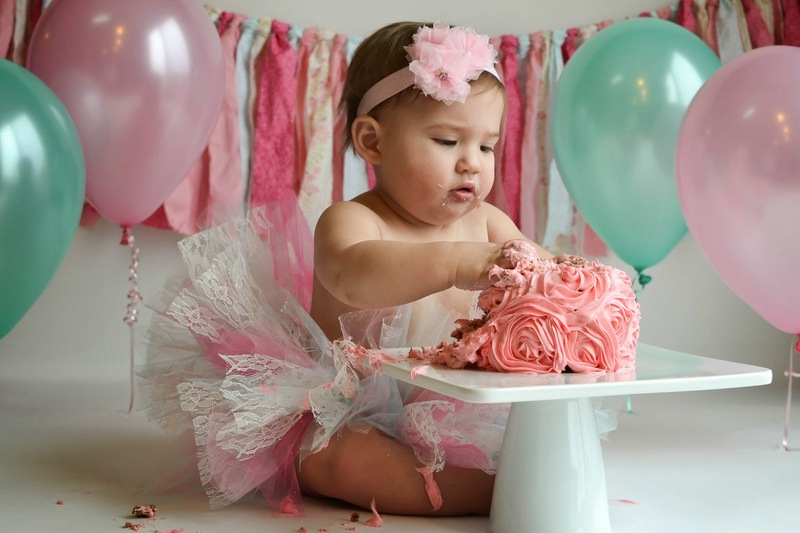 Don't forget to get some nice shots of the cake before your favorite one year old destroys it. And some shots of the child before they get all messy. Then bring in the cake and shoot away. I took over 300 photos and less than half of them turned out well. Remember to change up angles and camera settings. I was all over the floor trying to get some good shots. Don't miss their first bite! It took forever for Grace to touch the cake. She did not like the feeling of the frosting on her hands so we spoon-fed her a little bit. 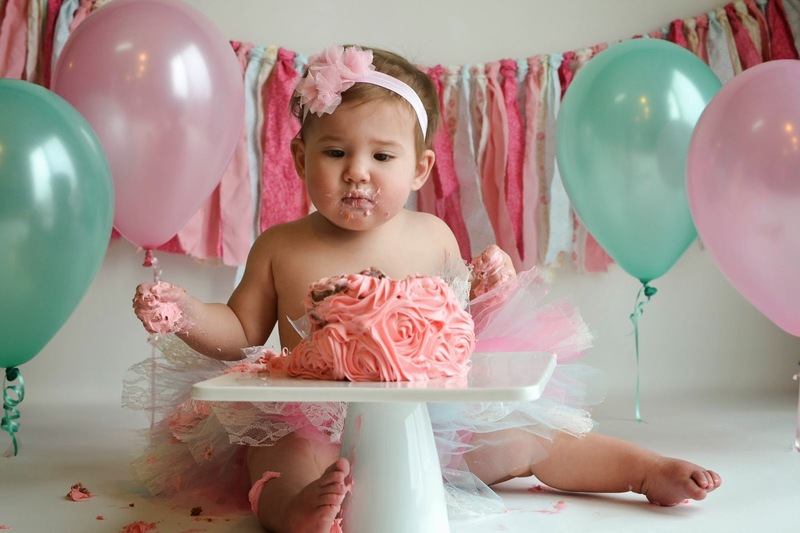 After she got that first taste we could't keep her away from the cake. I've never heard her giggle so much. She was even hyperventilating because she was so excited. Zoom in to get some great expression shots. Catch them getting their hands dirty, and make sure you have fun. The more relaxed you are the more relaxed your child will be. Also make sure to minimize distractions. Grace was always looking for dad. It may be best to have a bath ready to go before you start shooting. I really wish I had thought of this, because Grace's bathroom was pink by the time we were through. Did you actually buy your backdrop paper from Amazon or did you find it in a store around here? Thanks! Amazon may be cheaper though.